Front of $10 Confederate Bill Confederate States of America Currency Collection. Manuscripts, Archives, and Special Collections. Washington State University Libraries. Pullman, WA. The bill I chose is the 1862 Confederate $10 bill. I chose it partially because of the history behind it, and partially because I found it visually appealing – especially the details on the back. The bill was donated to the WSU library archives by the United States Treasury. The original engraving was done by Keatinge and Ball in Columbia, South Carolina. This particular bill was printed in 1862 as part of the B/3 series (both indicators appear on the bill) by Evens and Cogswell. The front of the bill has an illustration of a state building, maybe the confederate capitol building, plus an illustrated portrait of an unknown white man. The “B” in the corner, as stated earlier, indicates the series of the bill and when it was printed. There are floral elements and accents around the numerical ’10’ on the right side of the bill. The left side of the bill has ‘TEN’ spelled out, at a 90 degree angle, and a background of interwoven lines. The back of the bill, the part that really caught my attention, is a series of ten circled ‘x’s arranged in an x. 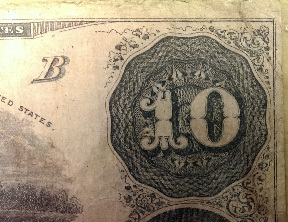 There are additional floral elements present on the back, a contribution to the continuity between the front and back of the bill, as well as illustrated ribbons containing the words “TEN DOLLARS”. The background pattern is crosshatching, and additional interwoven, almost braided lines. This bill does not contain a significant amount of color. The front of the bill is exclusively printed with black ink, though varied shading and weight add depth and a dynamic feel to the illustrations and décor. The back of the bill appears to be printed with blue ink, with the same weight and shading techniques used. Unique to the back of the bill is the crosshatching in the background. This provides the illusion of a solid background without actually printing nothing but blue, and adds to the contrast of the ‘white’ or negative elements on the page. There are multiple kinds of type present on this bill. In “The Confederate States of America”, all the text is capitalized with the first letter of each word sized up enough to differentiate it. “The” and “of” are angled at the beginning and between two of the words respectively, assumedly to save space on the bill and make sure the Confederate States was the focal point of the text. Script, Old-Style Serif, and Sans-Serif fonts are all represent on the bill, not including the actual hand-written signatures on the bottom. The typography dictates the function of the bill and indicates its worth. The hierarchy of text also makes it clear that the engraver/printer wanted to focus more on the worth and origin of the bill than, say, where it was printed, which series it was printed in, and why it was printed. The tiny text stating all of this is nearly lost in comparison to the much larger, and bolder, text in the center. The primary typography on the back would be in the decorative ‘X’s which are the same fancy serifed font from the front of the bill. This decorative type is another way the design is consistent between the front and back of the bill. I would be really interested to see a United States bill from this same era and compare them visually, I’d be curious to see if they had connecting elements or if the Confederates tried distancing themselves in more than politics from the northern states. Overall this bill is a fascinating look into history, and though other bills had better color, or more visually interesting typography, overall this one is a really solid example of currency design. At least for the 1860’s, I can tell you now there wont be many floral elements in my final design.